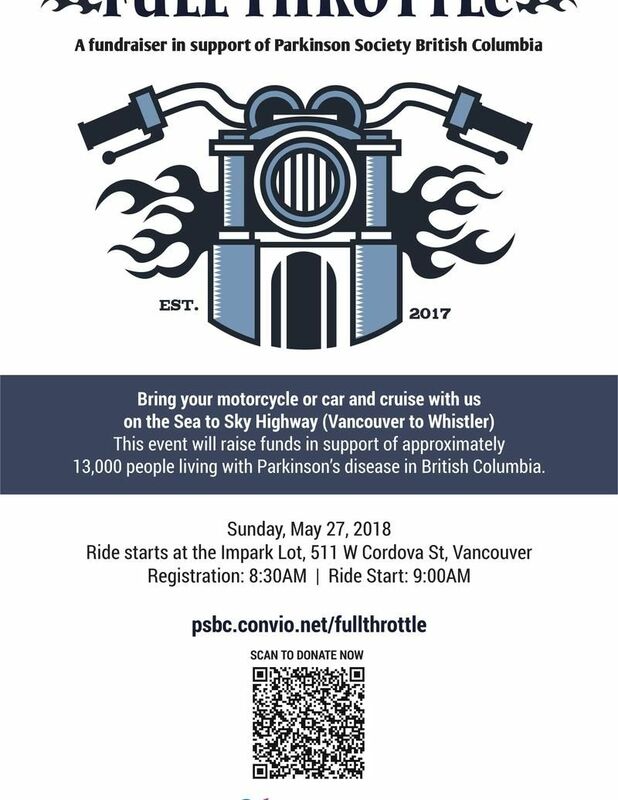 Join us for Full Throttle on Sunday, May 27, 2018 to enjoy a relaxed and scenic ride or drive from Vancouver to Whistler along the Sea to Sky highway. Proceeds from the event will benefit Parkinson Society British Columbia's critical programs, support services, advocacy efforts and contributions to research for approximately 13,000 British Columbians living with Parkinson's disease. To participate in this event, there is a registration fee of $50 (tax deductible), and we encourage you to spread the word to friends and family to support you with donations for our cause. Free parking: If you have provided your license plate on the online registration form, you may park for free anywhere in either Day Lot 1, 2 or 3. If you have not provided your license plate on the registration form, you must pay for your own parking as failure to do so may result in a ticket or being towed. Lunch: Join us at Longhorn Saloon in Whistler for lunch! Full Throttle participants will receive 25% off their lunch bill (alcoholic beverages not included). Prize Draws: Enter to win free lunch at Longhorn Saloon in Whistler! Full Throttle participants who join us at Longhorn Saloon in Whistler for lunch will be entered in a draw for a free meal! There will be ballots that you can write your names on to be entered into the draw. If you have any questions about the event, more information can be found at www.parkinson.bc.ca/FullThrottle.